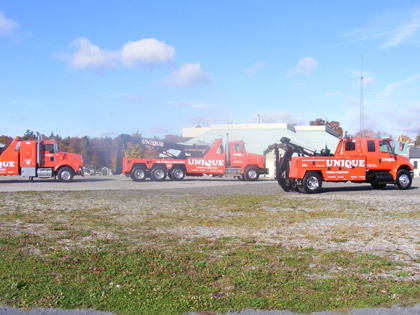 UNIQUE, Towing & Recovery is a privately owned business operating with John Dumbleton at its helm. Almost a half century old business and always keeping abreast of technology, UNIQUE has played an integral part in many people's lives. UNIQUE offers a vast fleet of trucks and machinery, an auto repair shop next door, a competent team of knowledgeable staff and a far greater reach and service with strategic alliances with Allstate, CAA, and Canadian Tire. Getting stuck in or out of your vehicle, or being into an accident requires empathy and professional assistance. Our crew of professionals has seen it all and has the fleet at its disposal to help you. Our fully licensed mechanics are on premise to get you back on the road as quickly as possible. From towing to auto service, Unique Towing & Recovery delivers unparalleled service.